What a great first talk we had from Margaret Salisbury, one of our honorary Vice-Presidents, on Wednesday 26th September evening. In a near full-house, the audience thoroughly enjoyed Margaret’s inspirational talk and images. There were significant learning points in the first half of Margaret’s talk that included images of some of the Welsh slate mines followed by some truly informative travel images of place and people in Ethiopia in the second part. This was billed as the Gracie Alison Memorial lecture and Gracie is remembered for her 40 years as Secretary of the Society. Gracie was instrumental in seeing EPS through some difficult times and helping to relocate us to Great King Street. Margaret knew Gracie well and chose to provide the tribute to Gracie in her own way. It was a great surprise that Margaret presented a portrait of Gracie, taken by Bill Wisden, a former Honorary Vice-President of the Society, who sadly passed away last year. The portrait will be hung in the newly refurbished library. It’s an excellent print, please take time to view it. It was widely reported that the Prime Minister, The Rt Hon Theresa May MP, visited Edinburgh on the 7th August 2018 to sign the Edinburgh and S.E.Scotland City Deal and that she had taken the opportunity to experience some of the cultural events of the Edinburgh Festivals. 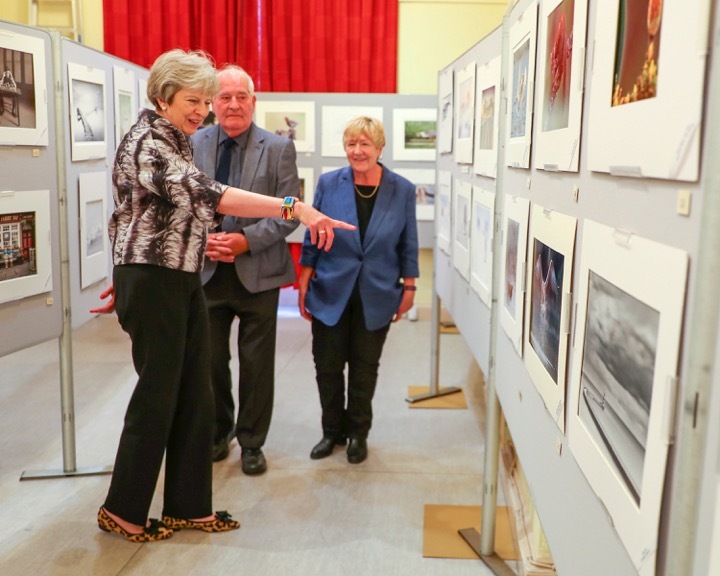 We are pleased to say that one of the events attended by the Prime Minister was the 156th Edinburgh International Exhibition, currently on view at our premises until 26th August. Here is the Prime Minister being hosted by two Past-Presidents of the Society – Edith Smith, Chair of the 156th Edinburgh International Exhibition and Sandy Cleland Honorary VP EPS. 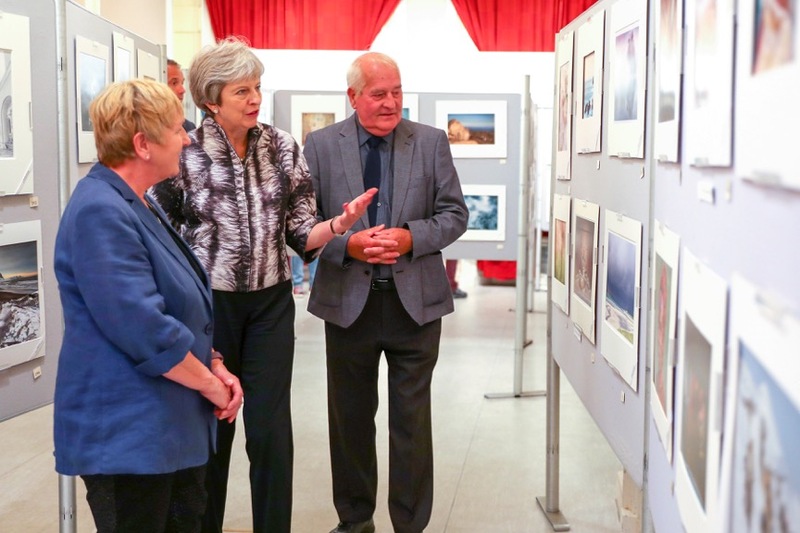 The Prime Minister, Theresa May, visits the 156th Edinburgh International Exhibition (7th August 2018). Hosts Edith Smith Chair of the 156th Exhibition and Sandy Cleland Hon VP EPS. The Prime Minister Theresa May visits the 156th Edinburgh International Exhibition (7th August 2018). Hosts Edith Smith Chair of the 156th Exhibition and Sandy Cleland Hon VP EPS. ‘Richard Spurdens photograph’ Where you can find posts about his FIAP experiences. In all cases you have to be aware that the requirements for FIAP distinctions changes over time, so that the early posts about obtaining the AFIAP will seem to require less acceptances etc than in the current rules. NEWS ON PHOENIX PAGE. MEMBERS PLEASE READ. A new look for the EPS Web site! Welcome to the EPS’ new web site. We hope you will find it easy to use and an improvement on the old site. The aim was to have a clean and simple modern site with a minimum of clutter. The dark background was chosen for good legibility and a sympathetic background for viewing images. Your comments and suggestions welcome- either in the comments below (will be moderated), or email Tom Gardner or use the contact form to contact the Webmaster. Feature requests will be discussed by the website group, who have jointly approved this design. Image galleries: The original image galleries will no longer be used, and we have also dropped the forum. This is because neither were used much in recent years, and we do not want to have a site people need to register with and log on to. Those who need to contribute news items or edit pages can be set up with an account with appropriate privileges. If you really want to look at the old image gallery site, it is still online here. While the site can have images displayed locally in galleries, we are mainly going to be using embedded feeds from various Flickr groups that we currently have, or will set up. This will give members who use Flickr to add their images directly to these groups (currently DeLOS and the C-D group). For others, who do not wish to use Flickr, the relevant group person can upload their images to the EPS Flickr account, or the member can email them direct to it, and they can be added to the groups from there with appropriate attribution to the photographer. News items: We plan to have most of the news items posted on the EPS Facebook page, which will then be visible on the EPS website as a news feed on the front page. This makes it easier for members to contribute items as many already have Facebook accounts, and they can get a lot more exposure through social media sharing. However, some items will be posted direct on the site. There will certainly be more additions to the site, but we felt that it was important to get a functional site up in advance of the new season, and additional content and improvements can be added.Please send any comments and suggestions to me, positive or negative- we need to know!